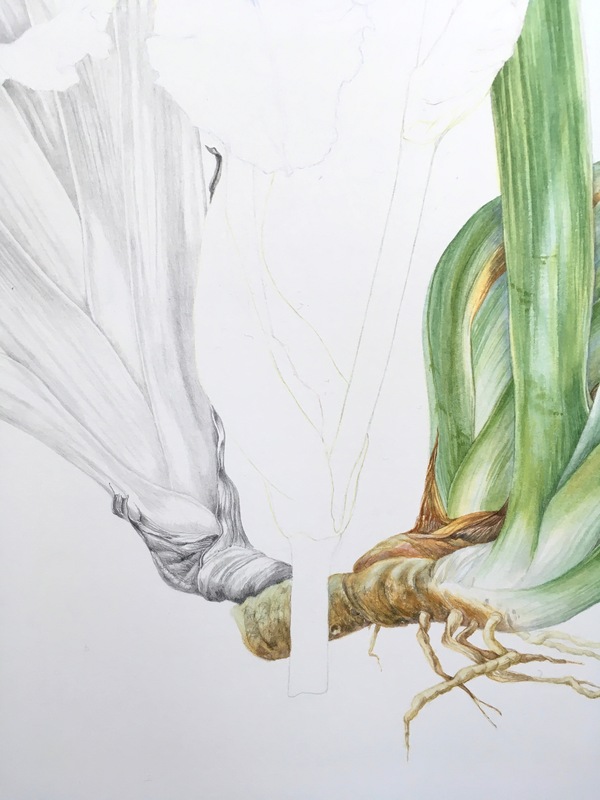 The Botanical Art Worldwide Exhibition; “In Ruskin’s Footsteps”, which is the English and Welsh contribution to the global exhibition happening 18 May 2018, is taking all my time these days, in addition to marking some really interesting assignments. 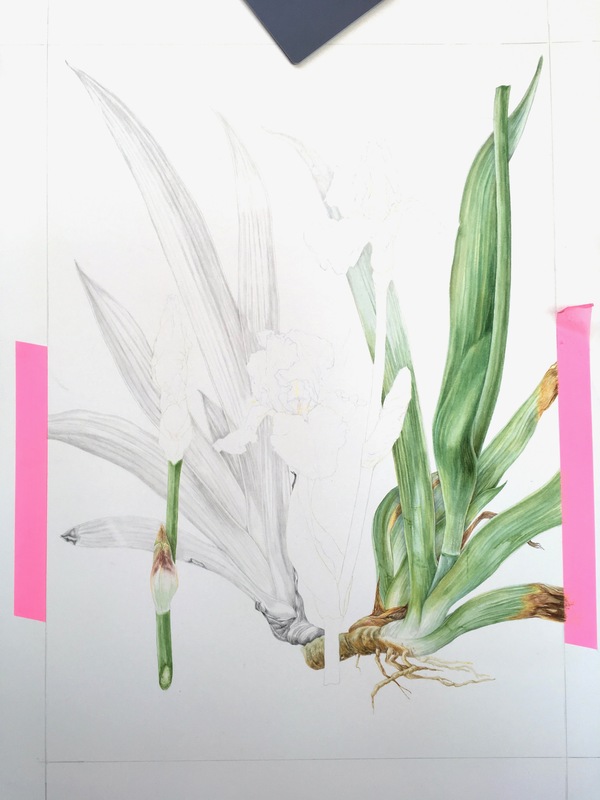 Attracting people to look at botanical art and perhaps trying it is always an exciting prospect. 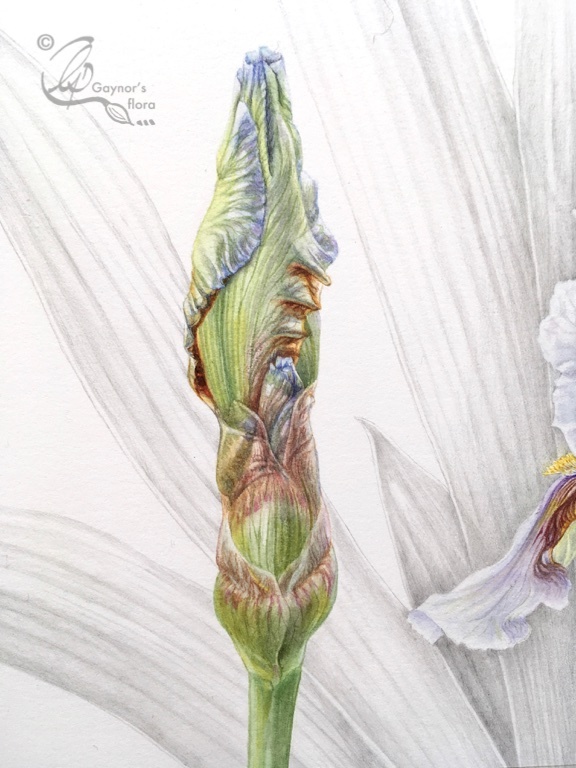 For the exhibition, go to the Association of British Botanical Artists (ABBA) website: www.britishbotanicalartists.com. Here you will find all the updated information. But I have done some more of my painting the Benton Iris ‘Farewell’. Last time I had done some of the leaves and told you that I was going to use graphite for some of them. I have decided that to show the habit of the Iris to the best advantage with the fan-shaped leaves, I would do these solely in graphite. In this way the overall effect of the picture will not be too heavy and the flowers will come to the for. It was not easy doing so much graphite on the heavy Fabriano paper (640gsm) and I will need to adjust the strength of this as I add the flowers. Below you get an idea of the overall layout of the picture with the flower spike with buds on the left side of the picture. To the right is the bottom bud on the flower spike. After finishing this section I needed to adjust it because it came directly below and in line with the top bud. 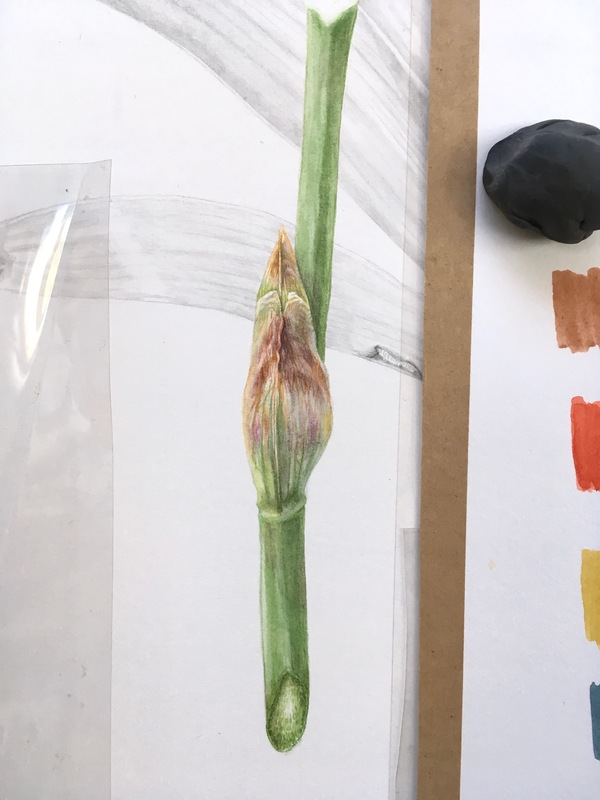 But as in so many plants the buds spiral round the stem and of course this is an important part of correct botanical observation. The ideal would have been to get it right first time during the line drawing and not after having painted it! The image below is the corrected version. Here you can see the centre line at the bottom of the bud, has been moved slightly to the left. And so the voluptuous terminal bud, with another one developing at its base. The bud of the Iris Farewell has a very typical shape to it and in my garden where I have different Irises, I can see the Farewell straight away. The tip is almost squared off rather than pointed. I think this is part of its attraction. You will notice that I have started the flower to the right, but I will come back to that in my next blog. Whilst painting each section of my composition I am constantly looking at the rest of my picture and adjusting as I go along. I added a little more shadow to the right of the bud after I had started the flower. The image is from that stage. I hope to get back to you soon with more images from the development of this picture. I have another workshop in just over a week’s time. 23 – 24 February is a workshop on Composition and Perspective. If you want to improve on these particular topics in your own practice, sign up for the workshop as soon as you can. It’s interesting to learn about the progression of a painting. The bud reminds me of hands in prayer. Actually you are quite right. It does for me too. I’m glad you are enjoying seeing the progression. I will make sure I complete it.